Keri Allan from SCI-FI-ONLINE interviewed Katharine Isabelle in 2001 concerning Ginger Snaps. Special thanks to Darren Rea. Keri Allan: What was your reaction when you first read the script for Ginger Snaps? Katharine Isabelle: When I first read a few pages I didn’t like it at all. 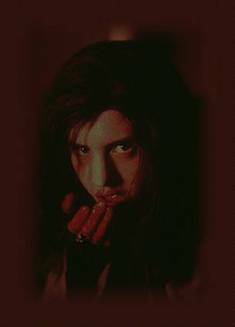 Emily Perkins [Brigitte] and I first got two or three scenes, and they were out of context. They were early drafts, and we didn’t like them at all. We thought it was like some cheesy B-movie, I mean we hated it! But we auditioned for it, and they liked us and they sent us a script to read. After we read the script we totally, totally loved it. Just because it was so different from what you usually see - it was a horror movie but it was completely character driven with strong independent females, which is something you don’t see very often. It was intelligently written, it was funny and it sounded like a lot of fun. KA: And was it fun or was it a lot of hard work? KI: Hmm, sometimes it was fun. (laughs) But on the whole it was probably the most difficult thing I’ve done in my life, and I think nearly all of the crew came close to dying. We were filming in Toronto in the middle of winter outside for most of the time, and I seemed to spend the majority of that time being soaking wet! Every week there’d be a new disease going around the crew. One week everyone had flu! Then the next week everyone had bronchitis, then everyone had laryngitis. Oh it was terrible. We were working for about 18 or 19 hours a day and then sleeping for around two hours, and we weren’t eating anything. We survived somehow, but just barely! KA: How did compare to other films you’ve done then? KI: While it was one of the most difficult thing I’ve ever done it was also one of the best things I’ve ever done. It toughened me up. Now I’m prepared for anything - I cant complain about anything anymore, because I will never be that cold, never be that wet, never have to endure the five hours of prosthetics. I will also never have to go home with blood all over me and hopefully I will never have to work 20 hours a day for six days a week again. KA: What was it like with all the make-up? KI: It was interesting. It took five hours to apply and two hours to remove. It was incredibly tedious to sit still for five hours while someone puts a little paintbrush in the corner of your eye. The special effects guy was really great. He would bring in a laptop for me and let me watch DVD’s. So it wasn’t too dull. Because my whole face was covered my skin couldn’t breathe, so my nose would run constantly. As a result I had to have Q-tips stuck up my nose the whole time! I dread to think what people thought when they saw this wolf walking around with 2 Q-tips up her nose! It was fun though. KA: So how did you get on with Emily Perkins, your costar? KI: We're actually from the same agency. We did the initial audition together. The two of us go back a long way. We went to the same private school, same elementary school, the same pre-school and we were born in the same hospital! But she is five years older than me, so its kinda weird because I followed her. But we get along great. We’re like bonded sisters now. We both had a lot of fun. I had it a bit harder than she did, but it was a lot of fun. She’d laugh at me and make fun of me and I told her to shut up (laughs). KI: We did those scenes on one of the first days and it was OK because when you’re on set everyone’s laughing and having fun. But we were covered in blood, and in the house we were shooting it in was a four year old boy. He was watching Teletubbies in the living room. Our changing room was in the basement of his house so every time we finished filming one of the death scenes we’d have to go through the house. We’d have to send someone in to make sure the little boy was still watching TV so we didn’t traumatise him completely! It was so bad! But my favourite part of the movie is the opening credit sequence. The most difficult death scene to film was the one where we were lying face down in water. I was in the water and Emily had already done this one. Emily had left her nose and her mouth open - I don’t know why she did that. It must have hurt a lot. So now it's my turn and the director said to me: "OK, open your mouth." And I think: 'but if I open my mouth the water will shoot up my nose, up my brain!' (laughs) And he said: "Emily did it." But Emily’s Emily. I really didn't want to do this - I was scared (laughs). I tried and I choked in two feet of water, so that was the worst part of filming. Oh, and close second was having to wash after each scene because the blood was so sticky. It was in my hair, up my nose, in my eyes and in my mouth. Oh,it was horrible! KA: So how did you think the film would be received when it was released? Did you have any idea it would be so popular? KA: So did you really enjoying doing a horror? Had you ever done a horror before? KI:I did an X-Files episode [playing Lisa Baiocchi in the season five episode Schizogeny], but nothing like a full-out horror movie turn into a werewolf eat people kinda thing. KA: Would you be able to do something like that again? 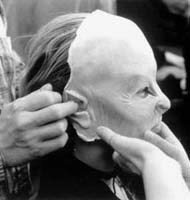 Go through with all those prosthetics? KI: Well, the prosthetics, it was hard, but you know it was OK. I’ve had a lot of people ask me if I want to do a lot of horror movies, and can't really say whether I do or I don’t because Ginger Snaps wasn’t really a horror movie. To me, it was more like a movie about these two sisters whom I empathised with. I think it would depend on the individual script, the individual story. Like if something comes along that’s like that, that is character driven, has an intelligent story, has strong female characters then I might be interested, but whether I'd actively seek out a movie just because it was a horror film, I don't think I would. KA: What did you think of linking lycanthropy to periods in the story? KI: I thought that was great because it is totally what its like going through puberty. This monster completely invades your body, you don’t know what’s going on and no one tells you in any detail what to expect or what to think. I thought that that metaphor was really well done. KA: Did you think you related to the character of Ginger? KI: Emily and I are very much Ginger and Brigitte Brigitte is a slight exaggeration of Emily, and Ginger is like a full out exaggeration of me on a bad day! (laughs) They are very close to us. KA: So what have you been up to since Ginger Snaps? Has it helped your career? KI: Oh yeah sure, there have been a couple of things which have come from it. Going down to LA, getting LA representation, and things like that. I shot another feature, another Canadian independent, called Turning Page, and that’s doing quite well, but not getting a huge release like Ginger Snaps or anything. Then next spring I've got a movie coming out with Al Pacino. I finished shooting that in the spring. Its called Insomnia. Its directed by Christopher Nolan who was the director of Memento, its his follow up picture. Its got Robin Williams and Hilary Swank. KA: What was it like doing that? KA: Were you at all star struck? The first scene we have he is dragging me out of a car screaming in my face and yelling at me and making me cry. That was the first thing I did with him, and I was already completely intimidated, but I got through it somehow. The next day we had a scenes were we had to sit in a car and talk and stuff, and that was more terrifying, because I was stuck in a car with 'Al Pacino' and I had to talk, like had to make conversation. I had no idea what to talk about. What do I say? Do I ask him about his kids? He’d just had twins, so I ask him: "What are your kids names?" and he goes: "Oh, Al and Al after me." My heart stopped beating and I’m thinking how do I go on from here. Is he joking, and what if he’s not joking and I laugh, I’m gonna get fired! I’m completely stressing out and he must have seen the terror in my eyes because he goes: "Oh no! Ha ha, I’m just kidding, its Anthony and Olivia". KA: Ah, but did you beat him? KI: Sort of... they told me there was going to be 20 people at this thing, so I wouldn't really have to play - which is just as well because I don’t really know how to play. The whole thing came about in the car when he starts talking about poker and I said: "I can play poker!". I mean I learned when I was seven and its not like I’ve played since then right? So he said: "If we have a game will you come?" And I said: "Of course!" Ha ha ha!! thinking I wouldn't actually have to go to a poker game with Al Pacino because that’s bizarre. A couple of days later I get this phone call, and its like hey, you’re going to Al Pacino’s poker game! 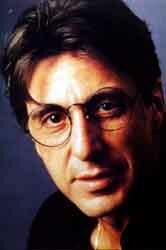 When I get there its Al Pacino, myself, and five producers. I was such a fish out of water! They were all like big LA producers, and I like totally don’t belong there and there I was reaching across taking Al Pacino’s money away. It was crazy, and the only people that were left with any money was Al and myself! KA: So what are you up to at the moment? KI: I’m auditioning at the moment. There’s no piles of scripts lading on my door yet. So It's back to auditioning, and trying to pay for my horses. I’ve got a five year old horse in training so I have to get jobs to pay for her, very expensive!